Study: When have I been swift to respond to the needs of others? When have I been slow? Pray: Ask the Lord for the clarity of sight to perceive the real needs within my reach. Every year I enjoy rereading the holiday story A Christmas Carol by Charles Dickens. I watch as many different movie and drama adaptations as I can, and I find in this simple tale much wisdom and insight. The story recounts the life of Ebenezer Scrooge, a miserable old man who is visited on Christmas Eve by the ghost of his business partner, Jacob Marley. 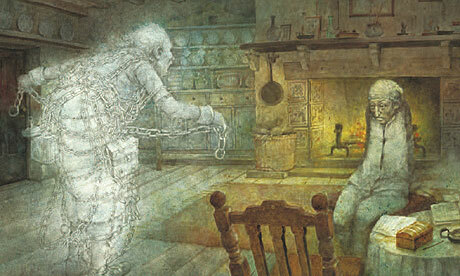 Marley informs Scrooge that he will be visited by three ghosts who will show him the error of his ways. During the visits we discover the story of Scrooge’s life, feeling both pity and anger at the circumstances and choices that have shaped him. As Scrooge slowly changes, he finally discovers the joy and spirit of Christmas – just in time for Christmas Day. The ghost of Marley begins this amazing process. Marley is a wretched creature, wrapped in bandages and shackled by chains and heavy money boxes. His words to Scrooge are direct and without comfort: he must change his ways or suffer a fate worse than Marley’s. This warning speaks to us as well. Every day we pass through life amid opportunities to serve and love others. Yet preoccupation can take us away from the deeper issues of life, separating us from the very people and events that can lead us into blessed happiness. As we prepare our hearts during this Advent season, may we take Marley’s warning to heart. We, too, must journey through this life, reaching out to those placed on our path. May we be vigilant, waiting for the day when Jesus will return. May we share the gift of our lives, anticipating the Christmas joy that awaits us. Note: This post was first published on November 25, 2014.